Yellow Iron Oxide is also known as hydrated iron oxide. This is one of the many colours of iron oxide. More accurately, it is an iron hydroxide. Yellow ochre clay contains yellow iron oxide. In ceramics red iron oxide is most commonly used in glazes and clay bodies, but black is also used. Yellow is the least colour-stable form. 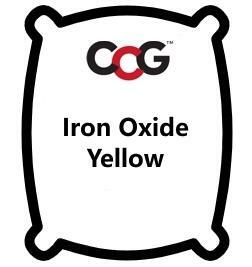 Yellow iron oxide is a synthetic material of very fine particle size (but not as fine as black or red). Yellow irons can be used where raw colour or other raw properties are important to the manufacturing process or colour of the unfired product and where a less messy material is desired. Yellow iron is not as fluffy and light as black, but more than red. It does not agglomerate as badly as red, but more than black. It is coarser in particle size and does leave some lighter coloured residue on a 325 mesh screen (up to 8% in one specimen we tested whereas the others left zero).